This whitepaper and accompanying template are designed for use by stakeholders of a .brand Top Level Domain (TLD) project. The documents are provided free of charge by Neustar in the hope that they will inform and inspire individuals and organisations to use their .brand TLD to its full potential. As applicants edge closer to activating their .brand TLDs for commercial gain, there is often significant confusion around how the TLD could be used, as well as challenges on how the TLD integrates with existing corporate and digital strategies. Our 10 step process has been continuously refined over the last five years and has been used by many organisations to provide a defined approach to getting the .brand TLD to market. Utilisation of this 10 step process will ensure that your .brand TLD launch is in the best position to meet all of these necessary requirements, and is aligned with your corporate strategy. Cross functional awareness of new TLDs, clarity on project ownership and the opportunities afforded by owning a .brand TLD are typically extremely low amongst internal stakeholders. Considerable effort will be required to raise awareness, educate and generate excitement. Your profile in the organisation will be raised significantly. When was the last time you had the chance to be the one informing senior people of something truly innovative and transformative? One day soon you will be the one in your organisation who was the visionary. Your workload and responsibility will decrease. Right now, you might be the only one taking any action. As the project progresses, the workload grows. By raising the profile of the project and gaining buy-in from senior stakeholders, delegation can occur. How can you engage stakeholders? Use whatever medium you can to communicate; videos, slide shows, internal roadshows, a quick chat over coffee, etc. Remember that many people will have little or no understanding when the topic of new TLDs is raised. Start with a background on the program. Highlight the big brands involved (Google, Apple, Nike, IBM, etc.). Show examples of early movers. There will be skeptics, but if done properly you will see people connect the dots and start thinking of possibilities on their own. Deputise these fellow-evangelists and empower them with the tools you created so they too can educate others. Demonstrate options for the TLD to add value to each department’s current goals and ensure returns are clearly articulated. Remind attendees that you’re giving them an opportunity to participate in the organisation’s digital evolution. For those that don’t participate, point out that the direction chosen may negatively impact them for years to come. Educating and motivating the executive member responsible for the function currently managing the .brand TLD project enables that executive member to educate and motivate other senior stakeholders, resulting in a top-down directive for support of the project. Once the relevant stakeholders have been updated on what owning a .brand TLD entails and the opportunities it presents, it’s time to get down to working out how the TLD can work for your organisation. Your .brand TLD is a branded piece of the internet. It is a powerful tool, but remember that it is a tool to support your organisation’s mission/vision/corporate goals. It is not a stand-alone activity that occurs off to one side. Your .brand TLD strategy should rarely bring a new corporate goal. Instead, it should enhance existing goals and bring new opportunities for branding and digital innovation. You may have noticed that the generic examples shown are not about replacing your main existing website. That could be one of the options you explore, but it shouldn’t limit your thinking in terms of other options. It’s vital to have a breadth of experience available to identify possible activation concepts and we typically run these as interactive workshops whereby we encourage all ideas – big or small. Having senior staff available for this can help to refine concepts within the boundaries of the current or future organisational goals or digital strategy. Invite your agencies – they will need to be involved downstream so it makes sense to engage them as soon as possible. Now that the plan for the .brand TLD has some great ideas that have been developed by a range of key stakeholders in the organisation, the next major question is: How do we introduce this concept into our customer experience as smoothly as possible? Focusing on the path to transition is an absolute must. From a customer’s perspective, imagine their first interaction with your new .brand TLD. How will consumers and stakeholders react when they first see your .brand placed on a billboard or in a television commercial? Your transition strategy should include tools to help overcome these mental barriers for customers and provide them with sufficient confidence and trust to support your transition to a .brand TLD. The initial launch phase of the .brand TLD communication needs to include elements of education and evangelism of new TLDs, alongside the product/ service/event you are using the TLD to promote. An Implementation Plan considers all major elements which need to be addressed in order to launch and operate a .brand TLD. One way to understand the Implementation Plan is to think of it like a checklist to help prevent critical items being overlooked. Based upon our extensive experience in launching major .brand TLDs around the world, we have built a proprietary .brand TLD Implementation Plan to help organisations document all of these requirements in a structured way. The Implementation Plan is based upon 21 key areas of activity – each of which is listed in Section 3 of this document. However, it’s worth noting that whilst these pillars provide a helpful guide for the activity you’ll be required to do, each .brand TLD strategy is different and needs to be customised to your plan accordingly. The Implementation Plan forms the basis for the full project plan which is followed from pre-launch through launch and ongoing operation. The internal project owner should take the Implementation Plan and develop it into a full, detailed plan with timelines and assignments that fit in with available internal resources and budget. Project implementation involves building and executing upon the full project plan determined in the previous step in order to launch and operate the .brand TLD. This phase will take months and depends heavily on the complexity of the organisation, the ambition of the strategy, and the length of the rollout/launch promotion. Senior project owner with project management skills. This person must be able to interact with the full range of functions inside the organisation and outside (e.g. digital agency), but also dedicate the time to executing on the full project plan. Senior project owner plus a project manager. The senior project owner is responsible for high-level deliverables, resource participation and reporting to the executive. The project manager executes the day-to-day activity and reports back to the senior project owner. ICANN mandates that certain policies must be published by each Registry Operator. However, the policy framework also needs to consider how the .brand TLD relates to the organisation on a commercial level, which is ultimately dependent on the strategy for the .brand TLD. Not just worse-case-scenario IT testing, but user experience, device/browser/platform testing, customer support and investor relations readiness, website re-directs, web traffic management and measurement, and more. The speed of the rollout should be tied to defined metrics. If the initial results meet these targets, continue or even speed up the rollout. If not, ensure that associated promotions and communications can also be slowed down until issues can be addressed. The launch will attract media attention, but not necessarily the media that normally focuses on the organisation. Digital marketing media, IT media, and even investor/analyst relations enquiries may be different from those the communications team typically deal with. Planning should obviously consider how existing security protocols need to evolve to accommodate the .brand TLD launch. However, even the best-laid plans cannot consider all scenarios, so post-event analysis should be conducted to identify any unforeseen security issues that arise during the launch. This is the most exciting part of the project; you’re ready to set sail with your new digital branding asset. There are two key elements that you need to be aware of at the time of launch. Ensuring that your customer focused messaging is prepared ahead of launch is vital as it’s reasonable to expect that you’ll get some attention from the media, suppliers and other stakeholders if you’ve done the launch correctly. This will impact every part of the organisation – from the Board to the call centre – so it’s also vital that your internal communications are undertaken before you go to market. For public companies, this level of preparation is potentially even more important. Managing the feedback is also key during the first phases of launch, and monitoring social media and other forums is absolutely vital to receiving feedback, handling criticism etc. Similarly, having your front line service staff up to speed is also important, as consistency of messaging with customer enquiries can be very useful to help any potentially negative feedback. Day to day handling of ICANN compliance enquiries. ¡ Reporting, record keeping, policy upkeep and management, consensus policies, Specification 13 (the .brand designation in the Registry Agreement). ICANN audits – which can occur up to two times per year, and will definitely occur at least once per three year period. Only two weeks warning is given prior to an audit. Names collisions obligations require offending names to be removed from the registry within two hours, which requires 24/7/365 availability of a suitably qualified support team. To meet obligations per Specification 11 of the ICANN Registry Agreement, any activity deemed malicious (e.g. spam, malware, phishing, botnets, etc.) must be actively monitored, addressed and documented. The challenge with managing malicious activity is identifying truly malicious activity versus false positives. Acting on a false positive can be very damaging to an organisation and its brand, so robust and expert assistance is strongly suggested here. Similar to any industry, actively monitoring and participating in the regulatory and governance environment of that sector is advantageous in order to protect and grow commercial interests. Monitor policy and governance changes to ensure TLD risks are being managed. Utilise your vote within ICANN’s Registry Stakeholder Group to influence policy and industry. Expert external assistance in this area is highly recommended. 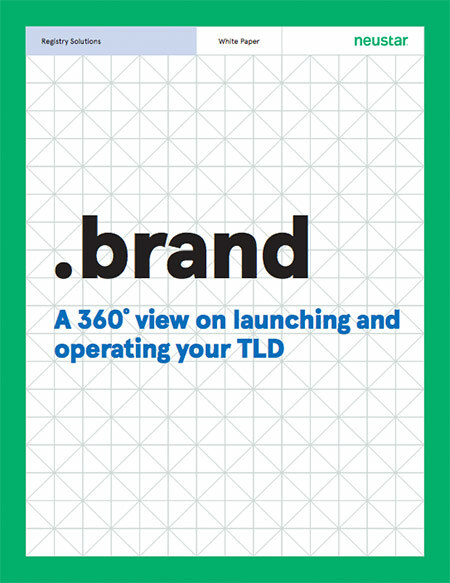 Launching a .brand TLD is much more than just a single launch date. Most strategies will include a gradual rollout, but even beyond the planned activity is the opportunity for ongoing innovation. Metrics will confirm or deny assumptions, which in turn will lead to insights. Other .brand TLDs will succeed with initiatives your organisation didn’t think of, which may be replicable without infringing intellectual property. Cost savings and revenue opportunities will present themselves.